This director's cut episode is brought to you without commercial interruption by XRX books: Now your socks can be a magnificent as your mittens! In this expanded edition of the original “Magnificent Mittens” that includes Anna’s toe-up, free-sole sock designs. With stranded patterning on the top of the foot and plain sole, it is elastic, easily reinforced, and easily repaired. No longer are color-patterned socks too much work for too little wear. I just listened to this interview and plan to listen again. 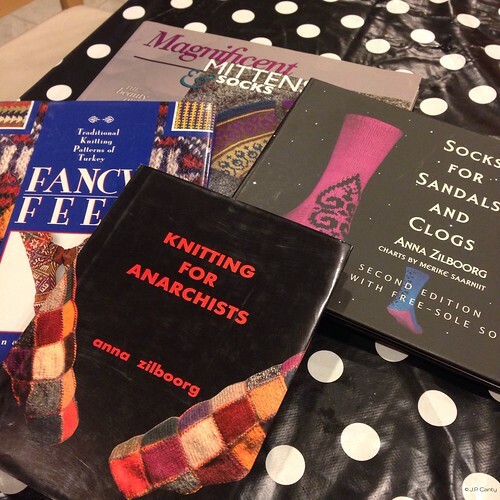 I have Anna's sock book and mitten book, but I am putting Knitting for Anarchists on my wishlist. Anna is a great speaker and I don't care if she is "grumpy". I too do my knitting my own way, even if my mother in law and her friends say I am doing things wrong. I have been doing my knitting "wrong" for 38 years, but it works out! Now I am doing my spinning "wrong"!! Anna sounds like a fascinating person, in all areas, not just knitting. I just bought the Interweave video of Anna teaching the Perfect Buttonhole. It's fantastic, and on sale right now for only $2.99. One thing I love about it (being something of an anarchist myself) is that Anna works the purls "Eastern" style (wrapped the other way around) and makes no apologies for that. However, I think she should at least mention that the viewer's stitches may look a little different. I can see how it could be confusing for people who haven't been introduced to this style of knitting.